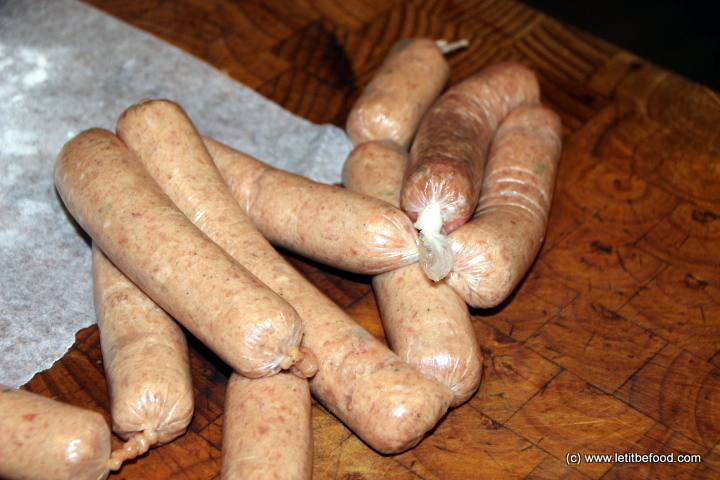 I've wanted to get more involved in the basics: growing herbs, pickling onions, making chutneys and now producing my own sausages. 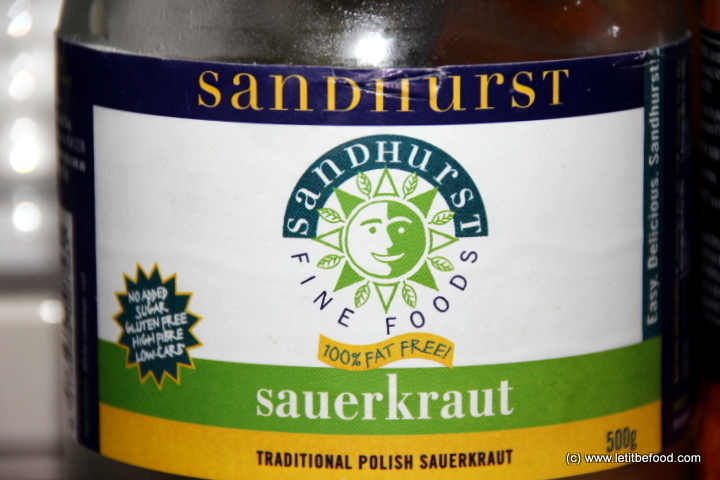 The latter follows from my current unbeatable hunger for bratwurst and sauerkraut and my long lasting love of the magical chorizo. 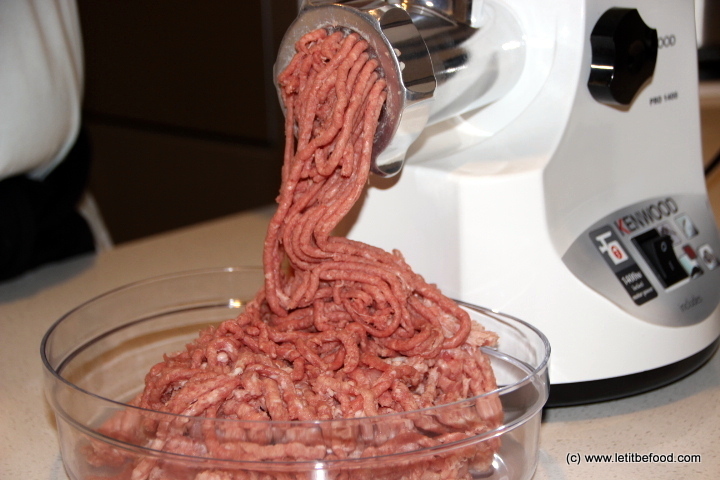 To cut a long story short I settled on the Kenwood PRO1400, a versatile little meat grinder / sausage stuffer purchased for $129 at a generous discount from Harvey Norman late in September. Being pretty busy lately I kept putting off getting started because of, would you believe it, the user manual. It was as thick as a phone book. Well a community directory anyway. I had to laugh when I opened the manual to find it had instructions in no less than 20 different languages. Now my English-language section seemed so much more manageable. 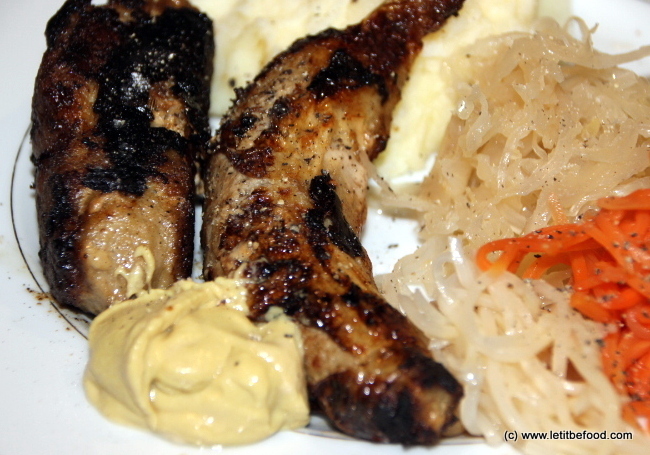 To cut a long story short I settled on a bratwurst for the first experiment. 750gm of pork shoulder, 250 of fatty beef chuck and a half a dozen herbs and other odds and sods. First step was to strip the ugliest bits of fat off the meat cuts, then cut the meat into long strips. 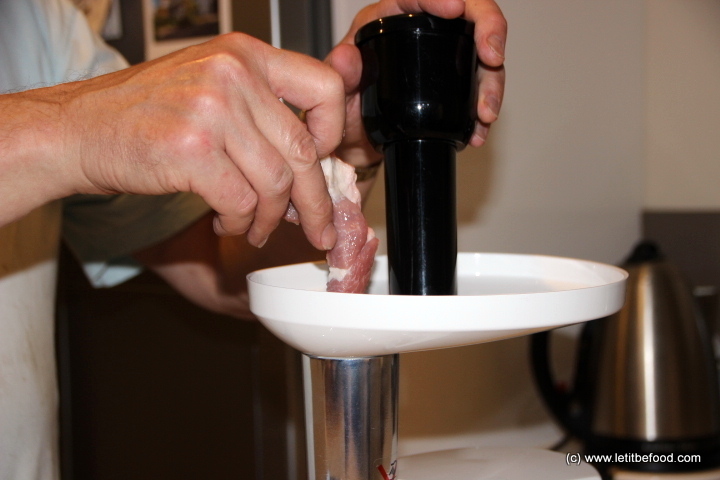 The strips were then fed into the mincer and out came the mince. 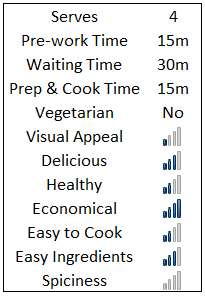 I chose a medium-grade mince on this occasion but I think I'd go fine next time. 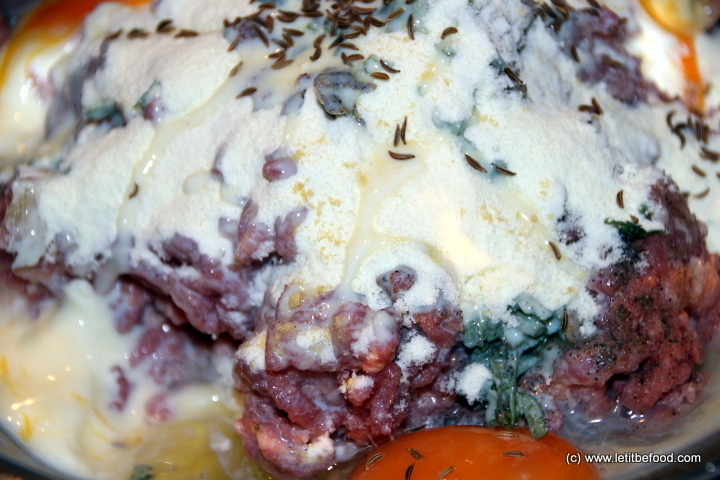 Once all the meat was minced it was time to add the herbs, eggs and custard powder (of all things). 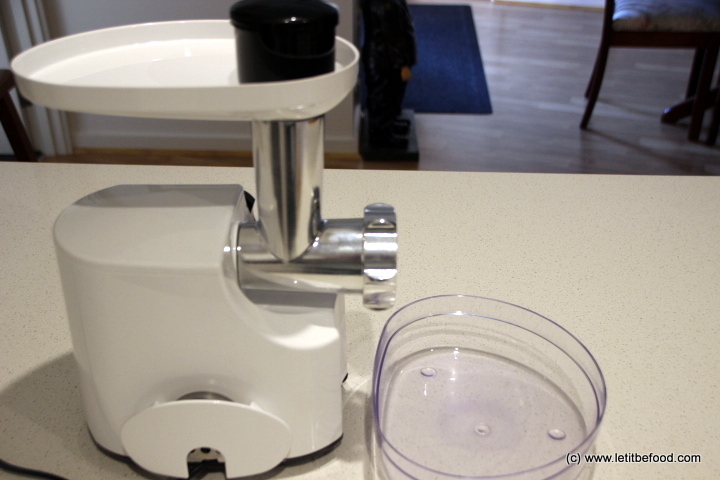 A good manual mixing with clean fingers ensured the meat and everything else, was well integrated. 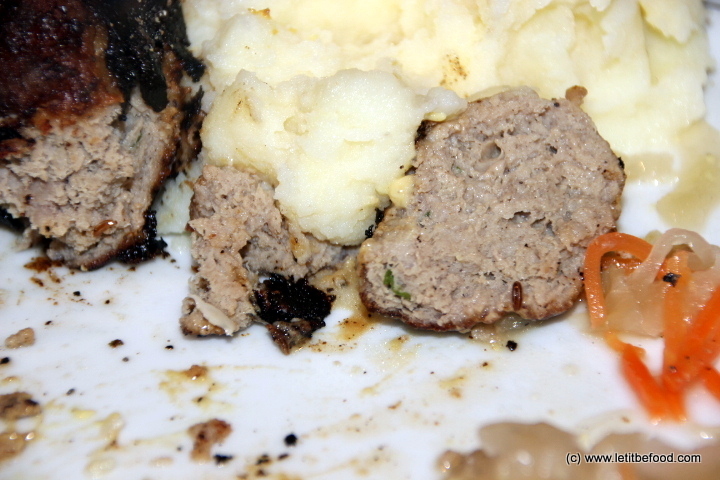 Then it was time for the part that I was most fearful of, the sausage stuffing. After consultation with my favourite butcher, he suggested synthetic skins would be best until my experience-level grew and I would find the dexterity required to use gut skins. He also suggested starting with thin snags which I did. For some reason I was expecting the mince to come shooting out at a great rate and render me out of control, instead, it came through quite slowly and control was the order of the day. The biggest problem was the twisting. 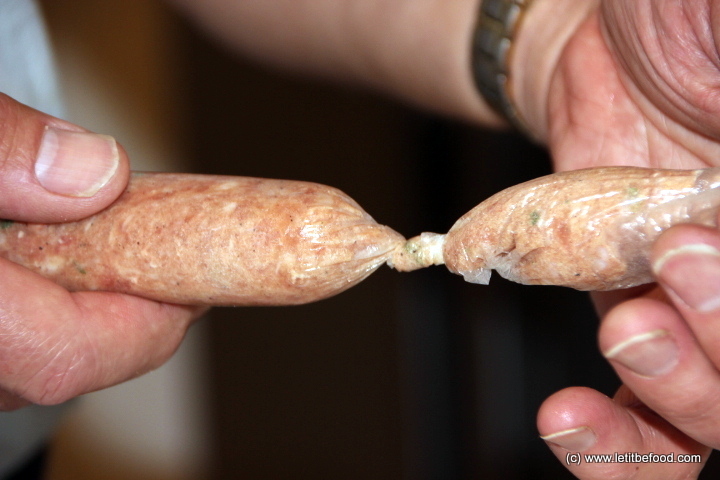 If you twisted Sausage A in a clockwise to make a join then twisting Sausage B in a clockwise direction untwisted Sausage A. I have not got answer on this matter yet and will defer to my butcher as soon as possible. 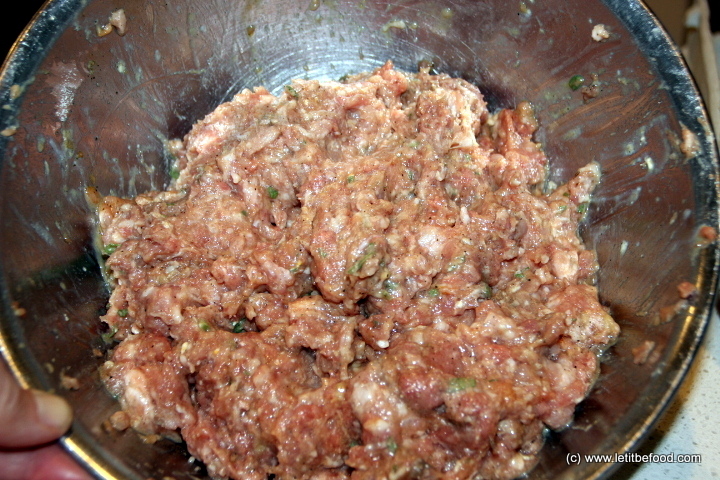 To cut a long story short, the kilogram of meat made 10 snags and 2 rissoles (2 sausages split after packing up the Kenwood so instead of wasting the meat, Myrna created a couple of rissoles). Happily, the Bratwursts were reasonably uniform in thickness but due to my inexperience, akin to a men's locker room before the game, the lengths were all over the shop. In a nut shell, the snags were awesome to eat. They were deliciously flavoured with overtones of fennel, garlic and chilli. The texture was great and there was enough fat to make them moist and juicy. Served with sauerkraut, pickled celery and carrot and some boiled spuds they made a delightful German-inspired meal. I look forward to becoming proficient in this interesting hobby and extending from Bratwurst into chorizos then onto unlimited combinations and variations of meat and vegetarian sausages. I hope you enjoy the mini-series which will be interspersed with other recipes and travel stories.